The product brand 'Gold to Go' of the corporation TG Gold-Super-Markt, after a previous research of the Spanish market looking for big cities in which the citizens know the true value of gold, found in Madrid a strategic point – the Westin Palace Hotel. 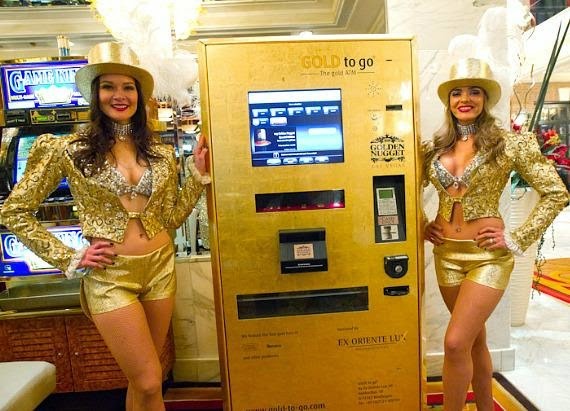 In September it was placed one of this extraordinary ATMs in which people can withdraw nothing less than gold bars and its culminating moment was this Christmas, as according to the experts lot of people give gold as a Christmas gift to face the crisis as “invest in gold bars is a short term resource, an insurance against inflation”. The golden machine located in the entrance of the hotel offers gold bars with a value between 100 and 3,000 euro, though its price is connected to the Stock Exchange and it changes every ten minutes. The available weight is from 1 to 250 grams and they come out already packed and ready to give it to its lucky future owner. Depending on the country, the machines offers different items. 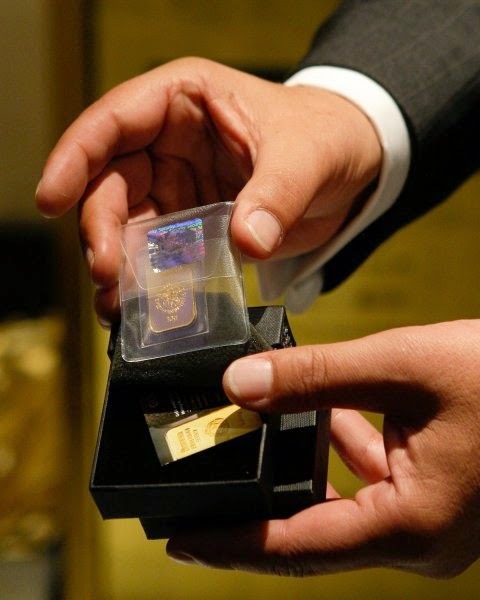 Particularly in Madrid, the most successful gold bars have been the ones between 169 and 3,245 euro. Not just big investors who buy the most expensive gold bars to speculate, but also ordinary citizens have been important clients during this festive days. Gold bars have left golden jewelry and other gifts in the background as a Christmas gift, as more and more Spanish citizens become aware of the importance of having gold reserves to ensure their own well-being in the future. Thousands of clients of the Emgoldex company in Spain and many other countries have been creating their own gold reserves for over 5 years of existence of the company ensuring a prosperous future. They buy investment gold bars with the most profitable prices in the online store of the company! Share this golden news in your social networks so everyone can take advantage of this unique opportunity!